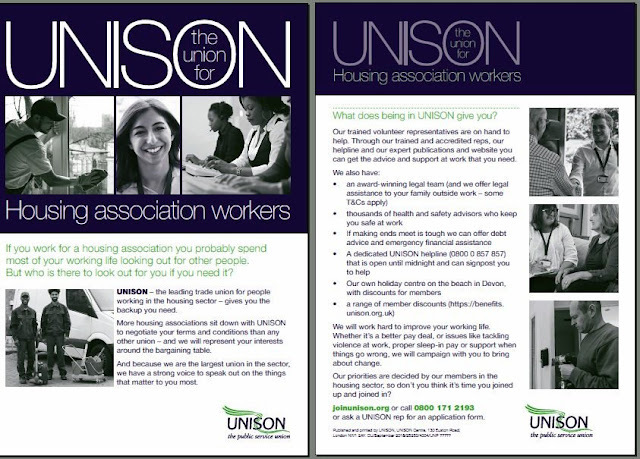 New recruitment leaflet from UNISON. A key message is that more employers sit down with UNISON to negotiate terms and conditions that any other union in the sector and that we represent workers interests around the table. I was an trade union activist for many years (firstly T&G then UNISON) before I realised that negotiating terms and conditions was the most important thing. Representation of members in individual discipline, sickness, grievance, redundancies, TUPE etc is really important (and horrible for anyone to go through alone). However, most members will only need personal advice or representation probably two or three times in their career. But everyone wants trained reps negotiating their pay, bonus, leave, pensions, sickness, maternity etc every year. Remember also the age old adage. The more people in the union. The better the deal we will always get with our employers.